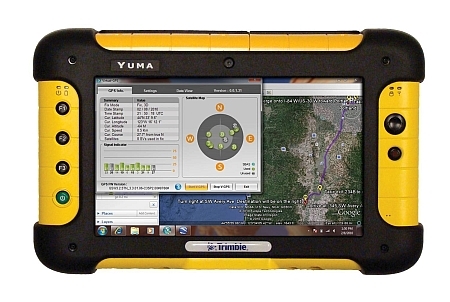 Trimble, the world leader in outdoor rugged computing, brings you the new Trimble® Yuma® rugged tablet computer, able to withstand even your challenging work environment. Safeguard your software and data in the face of dust, sand, mud, humidity and extreme temperature. Conduct inspections, collect information, capture photos and communicate with headquarters, all with the assurance that your data is protected. If this sounds like your everyday reality, take a closer look at the Trimble Yuma rugged tablet computer. The Yuma rugged tablet was designed to be fully functional in any outdoor environment – no matter how extreme. Overcoming the elements presents an initial challenge, since water, dust and dirt easily threaten the internal components of all but the most rugged of outdoor computers. The Yuma rugged tablet features an ingress protection rating of 67 (IP67), meaning it’s sealed against dust and has been water immersion tested for 30 minutes at a depth of one meter. Water and dust won’t sideline your Yuma rugged tablet. Shock, vibration and extreme temperature fluctuation present a second level of challenges to outdoor computing. Its rugged design incorporates a solid state hard drive, eliminating internal moving parts and providing protection against stress from impact and vibration. In addition, MIL-STD-810F specifications ensure that your Yuma rugged tablet computer survives bitter cold, blistering desert heat and everything in between– even accidentally launching your Yuma rugged tablet off the tailgate of your truck. Whatever computing projects your work requires and wherever your work takes you, the Yuma rugged tablet meets the challenge. Go from the office to the truck to the field and back with one mobile computer. Plus, it works all day on one charge*. Whether your office is an oil drilling rig, a military outpost, a fire station, a warehouse, a barn, or a muddy log truck, the Trimble Yuma rugged tablet gives you everything you need to get the job done. Tough-as-nails survivability and uncommon versatility merge to create the ultimate one-computer solution. Trade your desktop PC in for a Trimble Yuma rugged tablet computer – designed for the rugged life you lead. 1 To ensure best performance when temperatures are below –4 F (–20 C), be sure battery is inserted in the device only when in use. When device is not in use at these temperatures, keep batteries in a pocket or stored in a warmer area.